We wouldn’t dream of abandoning our vast semi–annual Most Anticipated Book Previews, but we thought a monthly reminder would be helpful (and give us a chance to note titles we missed the first time around). Here’s what we’re looking out for this month — for more April titles, check out our First-Half Preview. Let us know what you’re looking forward to in the comments! Six new collections we can't get enough of this month. 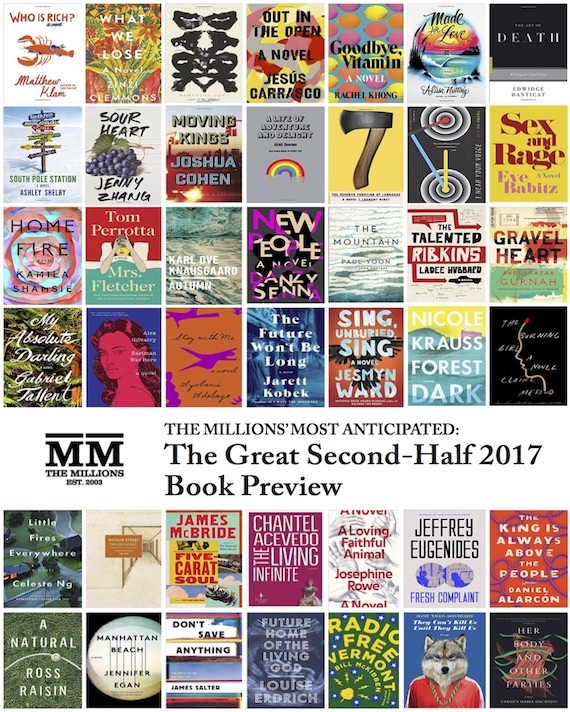 It’s the (second) most wonderful time of the year: Millions Most Anticipated Great Second-Half Preview time! Below you will find just shy of 80 wonderful books to get you from July to December 2017. We’ve got new titles from big names (Erdrich! Eugenides! Ward! Messud! ); we’ve got stellar debuts (Zhang! Clemmons! Rooney! Khong! ); we’ve got translated gems (Binet! Szabó! Krasznahorkai! ); we’ve even got cross-genre celebrities (Weiner! Hanks! McKibben!). The Millions Previews — both our semi-annual long lists and our newer monthly offerings — are some of the best things we do at this site. As Millions founder and publisher C. Max Magee wrote yesterday, you can help ensure that these previews, and all our great books coverage, continue for years to come by lending your support to the site as a member. The site has been running for 14 years on a wing and a prayer, and we’re incredibly grateful for the love of our recurring readers and current members who help us sustain the work that we do. Please enjoy the rich offerings below, come back August 1 for the monthly preview, and prepare yourselves for 2018 (which, according to our agents in the literary field, is going to be a doozie). Her Body and Other Parties by Carmen Maria Machado: Machado is a talented essayist; particularly notable are her pieces for The New Yorker, including “O Adjunct! My Adjunct!,” one of the finest examinations of the adjunct crisis in America. Her fiction deals with more surreal fears, with sharply-drawn pieces like “Horror Story” in Granta: “It started so small: a mysteriously clogged drain; a crack in the bedroom window.” Stories like “The Husband Stitch” are marvels of language and experimentation. A fiction debut to watch. (Nick R.). We wouldn’t dream of abandoning our vast semi–annual Most Anticipated Book Previews, but we thought a monthly reminder would be helpful (and give us a chance to note titles we missed the first time around). Here’s what we’re looking out for this month. (“Phew, it’s a hot one,” etc.) Find more August titles at our Great Second-Half Preview, and let us know what you’re looking forward to in the comments!